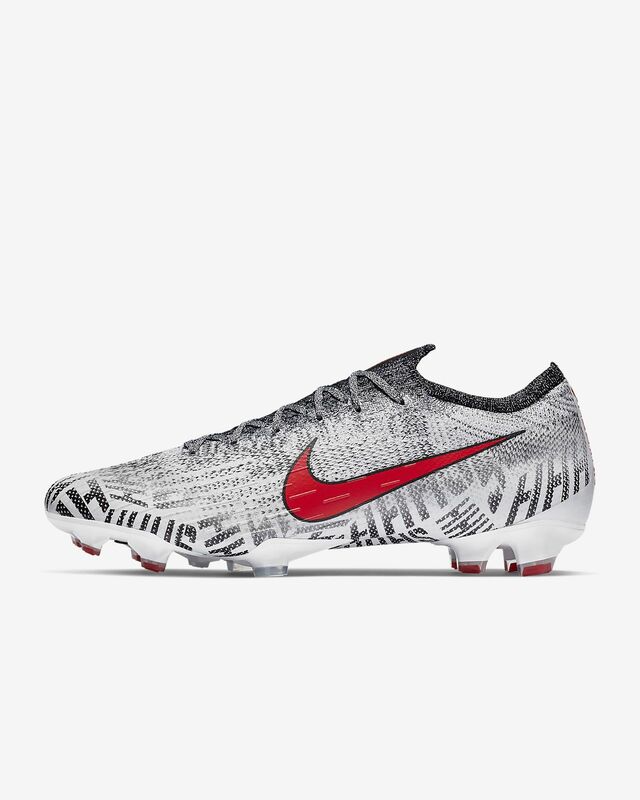 The Nike Mercurial Vapor 360 Elite Neymar Jr Firm-Ground Soccer Cleat wraps your foot in a Flyknit upper for a perfect fit with exceptional ball touch. The lightweight forefoot plate flexes for speed at every step. Graphics celebrate the legendary sense of flow, beauty and rhythm of the Brasilian style of play that Neymar embodies. The Flyknit has a 360-degree construction that surrounds your foot for a secure, second-skin fit. NIKEGRIP technology in the footbed features anti-slip yarns that provide maximum traction to help keep your foot locked in place. Textured synthetic material with All Conditions Control (ACC) technology gives you precision control at high speeds in wet and dry conditions. Lightweight plates under your heel and forefoot are contoured for comfort. Chevron studs give you traction for bursts of speed and quick stops. Firm-ground (FG) cleats are best for use on slightly wet short-grass fields. Nike Flyknit technology was inspired by feedback from runners seeking a shoe with the snug (and virtually unnoticed) fit of a sock. Nike embarked on a four-year mission with teams of programmers, engineers and designers to create the technology needed to make the knit upper with static properties for structure and durability. Then the precise placement of support, flexibility and breathability — all in one layer — was redefined. The result is a featherweight, formfitting and virtually seamless upper. This unprecedented precision maximizes performance while reducing the material waste of traditional cut and sew by an average of 60%. The equivalent of six recycled plastic bottles are used in every pair of Flyknit shoes, saving millions of pounds of material from reaching landfills. Have your say. 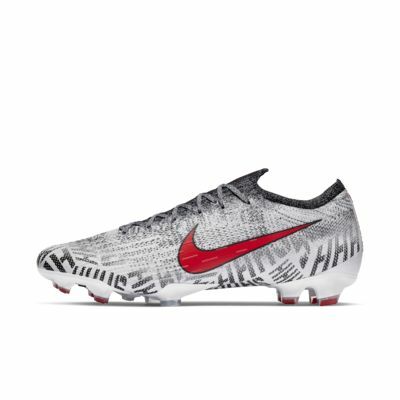 Be the first to review the Nike Mercurial Vapor 360 Elite Neymar Jr FG.